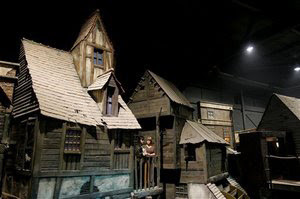 Further to my posts of 28 March and 12 April, here are a few new photos (courtesy of the Associated Press) of Dickens World in Kent, now scheduled to open on 25 May. Eddie Sampson in character as "Ned Fiendish," rat catcher. An unnamed "Dickensian character" at Dickens World. A view across the rooftops. Visitors enjoy a boat trip. Oh dear, sometimes the whole of Britain seems to be turning into one large theme park, and nobody seems sure where reality ends and fantasy begins. Hi, Keith. Thanks for posting! Have you read Julian Barnes's "England, England"? In that novel the Isle of Wight is turned into one big "best of Britain" theme park. Perhaps life is imitating art in this case. And i would like to let people know that it is a waste of time and money. It is nothing like they tell you on the internet. my children was very upset and did not like it. please not waste your money on it. i wonder if they will imitate the yellow air that enveloped london around november? I visited this weekend and absolutely loved it. Then again - I'm not British (I'm South African) and therefore I can see the positive side of things, instead of moaning about absolutely everything, or "slagging off" everything and everyone that tries to make an effort to do something great. 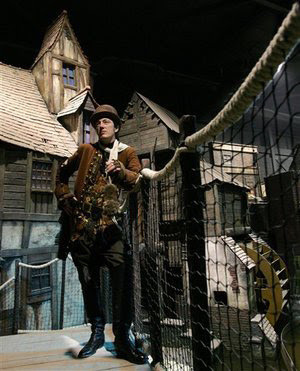 Dickensworld may have a few teething problems still, but its a fantastic experience - its not Disneyland... its about a little bit of history, coming alive.. its about IMAGINATION and about awakening a different world for kids. Only the most spoilt, NINTENDO addicted brats will go away disappointed. All the kids I saw loved the interaction with the entertainers and actors... played with wooden toys and skittles and were enthralled by the 'horrorsome' nooks and crannies. It is a waste of time and money, only if you're a jaded, soap-opera-big-brother-addicted person with no imagination. Thanks for your comments. 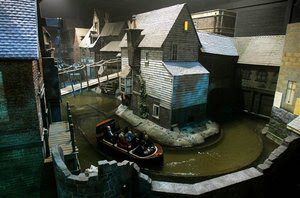 I encourage others who have visited Dickens World to send in their accounts of the experience. To get the lowdown, enter "Dickensworld review" into Google's search engine. You'll find paying visitors comments about their personal experiences when they visited. 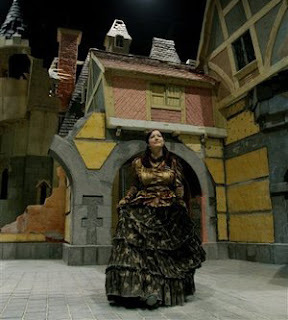 I visited Dickens world last month, it was fun... The staff had so much energy and a real love for the job! I will re-visit the complex again in 2008. I visited DW Sunday, Dec 9,2007. It was painful. I advise anyone interested in/loving Dickens not to go. The plusses are that the people who work there are lovely. The older employees genuinely seemed to want visitors to have a good experience. The younger employees seemed to be embarassed, and it was understandable. Having to mime Xmas carols, gin up enthusiasm for a project that Dickens himself would surely have found much to satirize. I heard thru the grapevine that a developer was responsible for the project and raised substantial sums from honorable organizations to fund the work. They should have kept their money. I predict closing within a year. This American visitor loves England and its people. If we Yanks are the originators of the themepark idea, then I apologize to you for this monstrosity that has been visited on you! You have something very good here but it could be fantastic. The theatre starts to get a little boring, intersperse it with some old music hall type songs - you have the perfect theatre for it. Standard of sandwiches should be improved as one side of the bread on most of them was stale. Lets see some more real Dickens in the gift shop. My favourite Dickens story is A Tale of Two Cities but there was no mention of it. I was hoping maybe to purchase the DVD of the old film in your shop but to no avail. Put a model of the square in a snow globe and I would certainly have bought one. Lets have a few surprises round the chinks basin walk, perhaps the odd prisoner really jumping out! The show in 3D was very good. Advertise the fact that you can dress up and have your photo taken. It was only when Molly told us that we realised and the clothes were all hidden away in a corner. Make sure when the photos are taken that they come out as we were very disappointed when ours did not and although we could have done it again the moment had been lost. Make people aware that their photos are taken in the boat we went on twice to make sure we had a good picture as the first one you could only see the people in the front of the boat. I hope you find the above constructive criticism as we had a really good day and found your staff to be superb. I came all the way from West Wales the day before after reading a write up in one of the broad sheets a few months ago. exiting project you have undertaken I would certainly visit again. i went on the boat ride lots of times aswell .people who say its a waste of time and money shouldnt really say that although it can be but you look at the postive side of it all and not the negative .I took my friends there and they really liked it and so did me and my dad (p.s didint like the rat that was above my head when my photo was taken )lol and i know that isnt a real rat for those thinking it aint real!